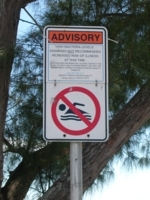 The Manatee County Environmental Health Services department issued a health advisory Aug. 12 for the waters on the south side of the Palma Sola Causeway near the mainland and for Coquina Beach north in Bradenton Beach. Health services director Tom Larkin said it is “not uncommon” for bacteria levels to increase after heavy rainfall due to stormwater runoff. Water-quality criteria is based upon standards set by the Florida Department of Environmental Protection and the U.S. Environmental Protection Agency, Larkin said. Tests were conducted last week to determine if the high levels remained at the two locations, but the results were unavailable at deadline for The Islander.